The ultimate healthy lunchbox guide. Real life, nutritious, nut-free and allergy friendly recipes. Heaps of information on shopping for healthy foods for kids plus a troubleshooting guide for lunches that aren’t getting eaten! 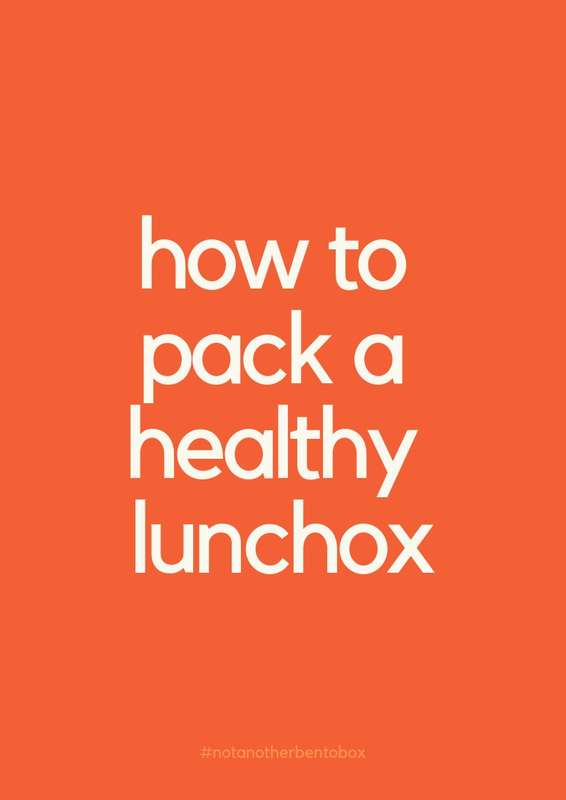 Not another bento box answers what to pack, and why! This ebook is a guide, not just a bunch of lunchbox recipes. 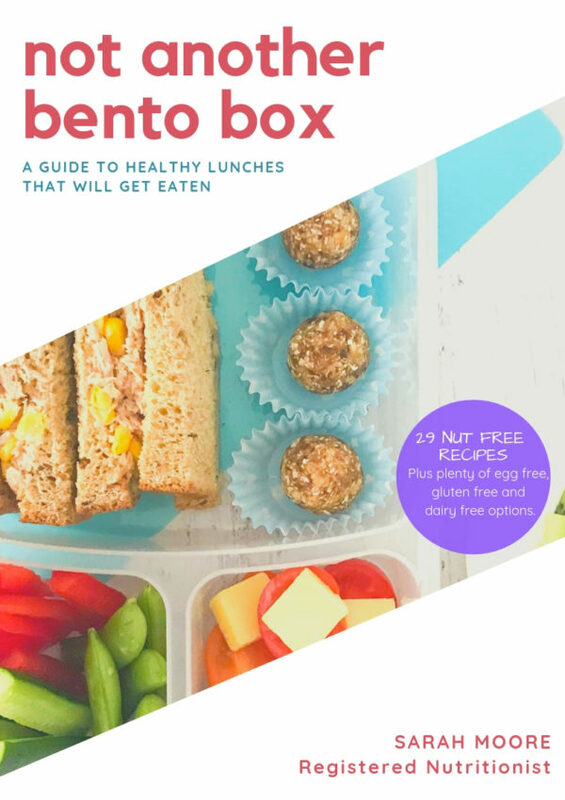 With over 70 pages you’re going to learn what’s really important when it comes to feeding your growing kids for the school day. 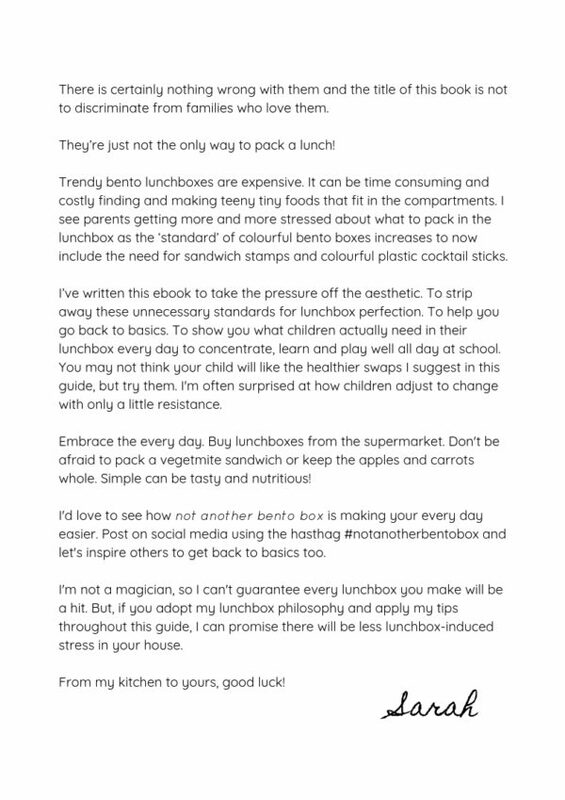 These are real-life lunchbox tips with brand name examples and real food photos to make your mornings of snack prep easier. 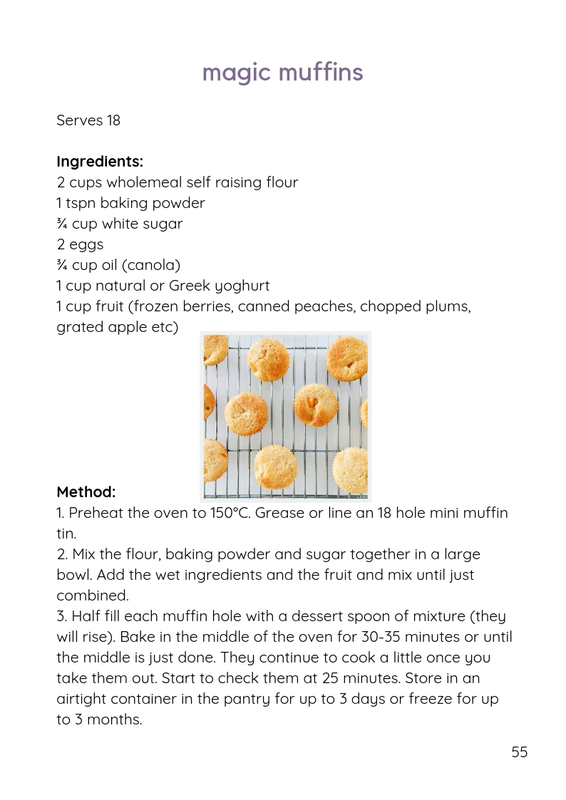 Plenty of egg free recipes plus options for adapting for dairy free and gluten free. A quick glance index for specific allergy friendly recipes. 12 complete packed lunchbox photos for inspiration. Information on how much food to pack. A list of foods NOT to pack. A guide to buying the healthiest bread with my top picks. A guide to buying the healthiest yoghurt with my top picks. A healthy shopping list so there’s always something for lunches. A list of Nutritionist approved packaged snacks for quick shopping. 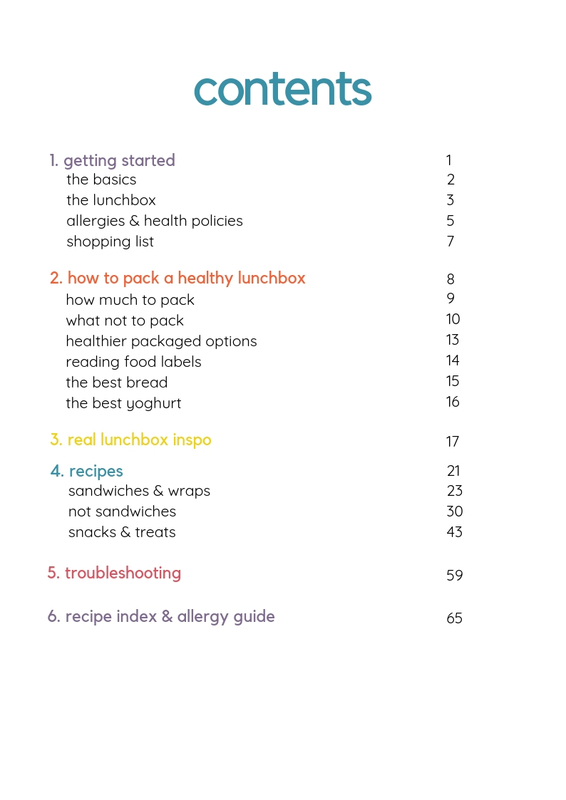 5 pages of lunchbox troubleshooting to solve common issues from uneaten lunchboxes to soggy sandwiches. This ebook is a PDF (11MB) suitable for viewing on most devices (PC, Mac, tablets and phones) or for printing and binding yourself. It is written with a large font for viewing on phones and tablets. A single purchase of this ebook can be downloaded twice within 30 days. Additional downloads must be purchased separately. Purchase of this product is through PayPal account or credict card. When you proceed through the checkout you will be taken to the PayPal website. You do not need to create a PayPal account, you can select the option to pay with a credit card. Once payment is processed, your order will be displayed in your account with a clickable link. 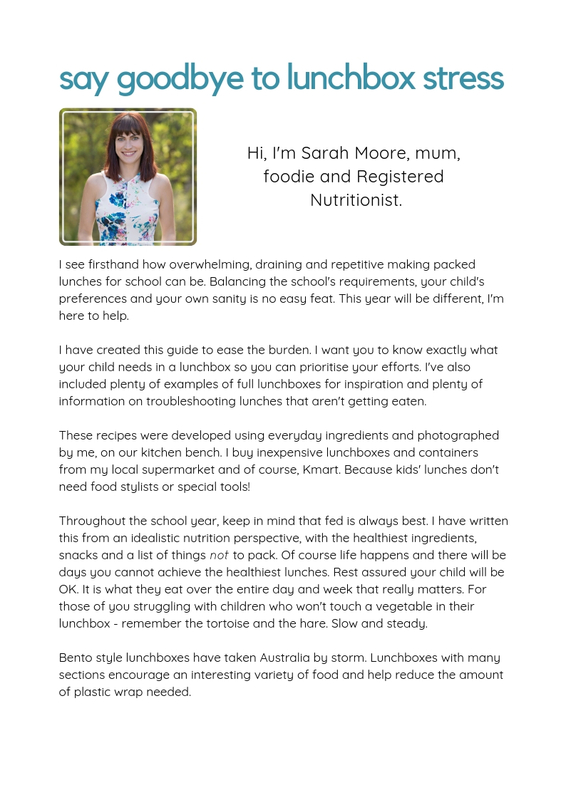 To access your download link at other times, login to your account at https://sarahmoorewellness.com.au/my-account/ and view your orders.